Testament has revived these classic titles from the EMI catalog using only the original EMI master tapes,cut onto lacquer at EMI's Abbey Road Studios and mastered using full analog techniques throughout production. Beautiful full-dimensional stereo. 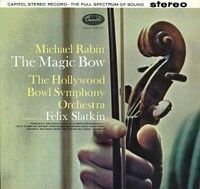 Michael Rabin, violin; Felix Slatkin conducting The Hollywood Symphony Bowl Orchestra. Works by Kreisler, Massenet, Sarasate and others. Gorgeous sound on this amazing record. Testament has revived these classic titles from the EMI catalog using only the original EMI master tapes, cut onto lacquer at EMI's Abbey Road Studios and mastered using full analog techniques throughout production.